Green America members and readers rely on our publications, e-newsletters, events, new media and web sites for world-changing resources. That’s why they support businesses and causes like yours. Green America members and readers rely on our publications, e-newsletters, events, new media and web sites for world-changing resources. That’s why they support businesses and causes like yours. Green America’s extensive marketing and PR efforts connect businesses with millions of consumers— from early green adopters to those curious about today’s green marketplace. Our team is here to help you grow your business, increase your membership and educate your customers through exclusive marketing opportunities. 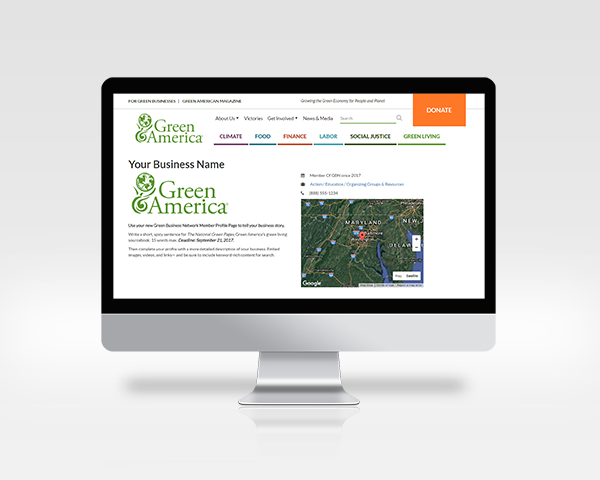 Only Certified Green Business Network Members may advertise with Green America. Our publications are your platform. If your business is looking for a targeted, high impact and affordable way to reach highly responsive customers, please call today to reserve your ad in the next issue or promote your business online. Not certified yet? We’ll help you get started. "When ad dollars are in short supply, Green America remains our first choice to reach our target market, people who care about their money as well as the planet." "Whenever I ask new customers where they heard about us, nine out of ten times they say Green America." Only Green Business Network members that have earned our Green Business Certification are eligible to advertise in Green America publications and on Green America websites. Green America provides the perfect venues to reach your core customers. Our individual members and readers care about bringing social justice and environmental responsibility into the economy. That’s why they read our publications and support companies like yours. Space is limited in each publication. Don’t procrastinate—contact us today! The nation’s premier resource for green companies to reach conscious consumers. Reader surveys show that the average consumer will purchase from 10 or more businesses. Digital companion edition includes color ads and advertisers’ rich media. Reserve space now! As the definitive directory of green businesses, our reach extends from local organic grocery stores to major retailers. A magazine for building economic alternatives, offering practical advice on sustainable living and responsible investing. Beautiful, 4-color, and available in both print and digital format with interactive ads. America’s most popular and comprehensive guide to socially responsible investing and banking. An excellent place to advertise for all SRI / impact investing companies and practitioners. Call today to be in the next edition. Grow your business when you connect to our online readers, who rely on our world-changing resources to find green products and services like yours. Get maximum exposure from your listing at Google’s #1 green business directory, GreenPages.org. Targeted advertising for green consumers and green businesses. Our individual and business e-newsletters are the sure way to reach high-affinity customers. Whether you are selling Fair Trade products or offering green retirement plans, these newsletters have proven results. Drive traffic to your site. Run promotions, special offers, or discounts on key pages throughout GreenAmerica.org, with over 2.9 million page views annually. Plus: The Green Business Network site is the perfect place to promote your B2B offer. Build holiday sales with seasonal gift guides. If you’d like your products or services considered for these types of promotional opportunities, please get in touch. Join the Green Business Network today. Earn your Green Business Certification to gain access to Green America’s 200,000+ network of passionate green consumers. Marketing Questions? Let Us Help You!